Cross over to 1,300km of adventures, all in one tank. Turn every journey into an exciting adventure with the Renault SCÉNIC. Standing out of the crowd with precise lines, sculpted shoulders and generous proportions, the Renault MÉGANE Sedan flaunts a coupe-like silhouette and masterful finishes that is set to turn heads on every journey. Each component of this class-leading sedan has been designed to create an exhilarating and status-enhancing automotive masterpiece. With design cues inspired by Renault Sport, the dynamic Renault MÉGANE GT is set to turn heads on the road. From the outside, the front bumper design signals the step-up in sportiness that goes hand in hand with the Renault Sport DNA. The honeycomb lower grille is wider and flanked by front aerodynamic air guides with Active Air Shutters that improves the vehicle’s aerodynamic and fuel consumption. 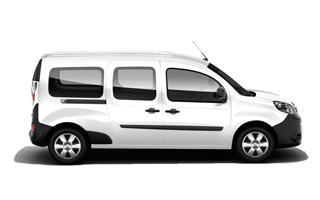 The Renault KANGOO's already popular design has been further improved upon. Taut lines and clear forms bestow it with a robust and reassuring look, while the new front end incorporates Renault's latest design language, with a bold logo contrasted against a black grille, along with more expressive and tapered headlights. Make your business the focal point with the Renault TRAFIC. Robust yet dynamic, the Renault TRAFIC’s front-end bears Renault’s new styling signature, with a prominent logo contrasted against the black grille. Specifications may vary from picture shown.